One of the best tools I developed over the years is one that helps communicate IT value and the level of success you are achieving. 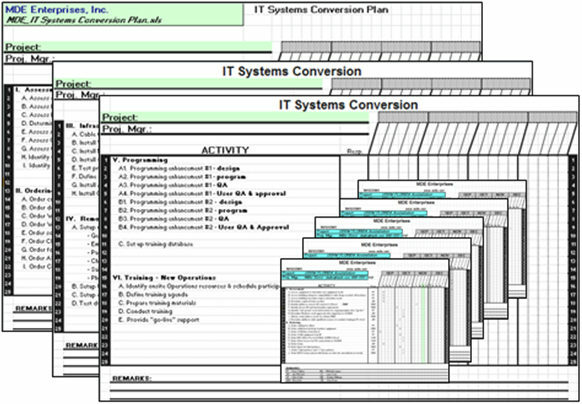 I call it the IT Initiatives Portfolio. 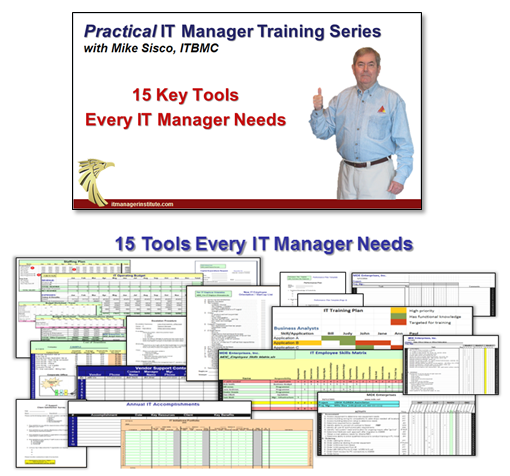 This is one of the Top 15 tools and templates I think every IT manager needs and I’ve written about it a couple of times, , , here is additional information that will be helpful in using this tool. Benefit results. I include columns for expected results and achieved results for both 6-month and 12-month intervals. You won’t use these columns for every project but it is certainly helpful to list some type of business value benefit for every project you work on, , , this is the value contribution your IT team is making. Overall success rate of each project – on time, within budget, achieving expected results, and meeting client needs. Ongoing success rates of completing projects successfully. You get this by calculating the percentages of success for each of the key measurement criteria – on time, within budget, and meeting client needs plus overall project success rate. This is your track record, , , something you need people to know about because it shows how good your team is operating. CLICK HERE to download a customizable IT Initiatives Portfolio template. Here is a “no brainer” about our IT support role, , , our job is to keep the business ‘up and running’. That’s right, most of us in IT have a 24 X 7, 365-day job to keep our technologies running and our business clients positioned to use them. Sooner or later you are going to have to support a company move, department relocation, or opening up a new office. The very nature of these activities suggests downtime, , , and downtime is an IT organization’s worst enemy. A move or relocation is a project just like any other project, and one of the things you want to do is to minimize the business impact in achieving your goal of getting the affected organization and people in place so they can be productive. I was the CIO of a company in the mid-90’s that grew from $30 million in revenue to over $600 million in just over 5 years. We accomplished much of this growth by acquiring other companies that provided the same type of physician billing services we provided. Many times we would acquire a company that had an office right around the corner from one of our offices. To leverage our investment we either consolidated the two offices into one of them or moved both offices to a brand new location. It seemed like we were moving a group of people to a new location or opening up a new office every week. Relocation activities create lots of opportunity for downtime and loss of productivity. Downtime was a huge cash flow and client satisfaction problem in this industry, , , if our employees could not bill and produce insurance claims and collect the money for physician services, our physician clients didn’t get paid and neither did we. Minimizing downtime was a key objective because our success depended upon it. Checklists like this one and others we used helped our IT organization minimize downtime and disruption to our business by completing projects reliably and consistently, , , ingredients for a positive IT support operation. IT employees have a huge need to understand what it takes to be successful. They also want to know if they are achieving success. Two of the highest quality times you have with an employee are when you deliver a performance plan to the employee and later on when you deliver the performance review based upon that plan. Performance planning and review meetings are excellent coaching opportunities. They give you the chance to spell out exactly what you want from your employee and an ability to reinforce areas where improvement is needed. I use a simple Employee Performance Plan approach. In each employee’s plan, I target major objectives such as Client Service, Quality, Productivity, or Training & Education. In each targeted area, list specific performance objectives that are important for the employee’s success, , , and that contribute to your IT organization’s success. For each major performance area, you should place a weighting factor to help focus the employee on the most important aspects of the plan. It also helps you establish a more objective performance evaluation when you do the review. Developing a performance plan for an individual can take several hours if you do it from scratch. 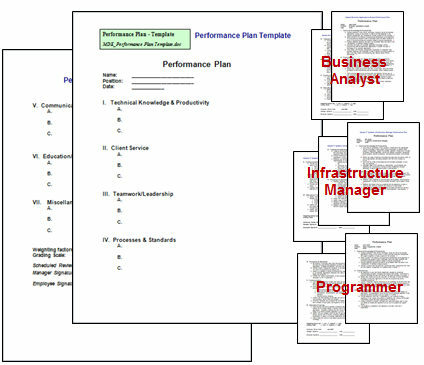 A tip I like to use is to develop a standard performance plan for each group within my team, , , for example a standard template for programmers, one for business analysts, and a separate standard for Help Desk staff, etc. I’ll spend a couple hours developing the standard for each group. But, when it comes time to develop individual plans, I simply take the standard and tweak it for the employee I’m developing a plan for. A good example of this is to use programmers as a group. If you have two programmers you want to develop performance plans for, you start each plan with the same programmer performance plan standard you’ve created. Every programmer has Training and Education, Productivity, and Quality performance focus areas in their plan. However, the two programmers are very different and should have different levels of focus in their individual performance plan, , , possibly even different action items or responsibilities. For example, one programmer needs stronger focus on quality but not so much in productivity. The other programmer is just the opposite, , , he needs better focus on productivity but not on quality because he does such a good job in programming quality already. You tweak these sections of the plan to for each employee appropriately for what they need. Creating a standard plan for a job discipline such as programmers or PC Techs will help you develop individual plans for employees within those disciplines much faster and more consistently with one another. Click on the following links to download the template and sample performance plans I’ve developed and used. Another good tip is to maintain a file for each employee and drop in notes during the year that reflect the positives and “needs improvement” issues so you have reference information to use when you develop the employee’s performance review. I usually spend a good bit of time on the reviews and try to write constructive reviews that provide the employee with real substance that will help them. You owe it to your employees to do this, , , they work hard for you and need your guidance. Having notes from activities that occurred over the past 12 months helps you provide substance that is reflective of the entire year rather than just the last couple of months. Above all, don’t miss out on the quality time you have with your employee when delivering their performance plans and reviews, , , it’s too important to neglect. Have you ever had another manager in your company come running to you requesting a PC for a newly hired employee who just started with the company? This manager may not have a place for their new employee to sit, but the employee won’t be productive until they have a PC. Even though it’s not your IT organization’s fault, you still get blamed if the PC isn’t deployed immediately. What’s worse is that the manager who failed to prepare for the new employee has created a morale problem within his own organization. You see, other employees are joking and discussing among themselves about how poorly prepared we are for our new employee. Don’t let this happen to you or one of your IT managers. Take charge of the situation by organizing and preparing yourself for when a new employee joins your team. 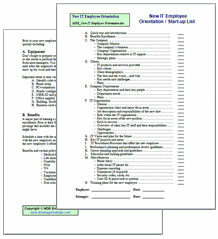 You can do this quickly and easily with a New Employee Orientation Checklist. Using a checklist like the one I developed and used will help you start a new employee quickly and productively plus it sets the tone that your organization is organized and focused. It’s a big deal for employee morale, , , both for the new employee joining your team as well as your existing employees who see what’s going on. Training and education is one of the most powerful motivators for IT employees. It always ranks in the top 3 reasons why IT people stay with their company while money usually ranks 7th or lower. What this means is that you should have a training focus for every employee in your organization. Employees are motivated by the fact you are investing in their professional development and doing things that will make their job easier when you create more depth. It helps if you have an overall game plan and a tool that helps you see your entire training focus. 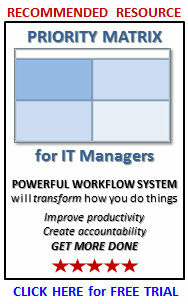 One of the tools I used recently in a management consulting engagement is the IT Training Plan below. List the training you want to focus on in the first column. Highlight the high priority training classes. List your employees across the top row. For each class, identify those who have functional knowledge by shading the appropriate cell green. For each class, identify each employee you want to target training for by shading the appropriate cell red. It’s that simple, , , now you can easily see what will be trained and who will receive the training. The final step would be to determine who should develop and deliver training for each class, , , and then target the training dates. One recommendation is that when you actually deliver the training classes, you should consider recording the class so it can be used again for other employees in the future. Take a look at the post Create a training studio for your company to learn how to develop a training studio quickly and inexpensively. Invest in your people by providing a focused training curriculum that hits every employee in your organization, , , it pays real dividends. One of the first things you should do in an IT organization is conduct an IT assessment. A key component of this discovery process is to determine the capability and capacity of your IT staff, , , in other words, what your organization can do and how much it can do in terms of providing IT support. Failing to understand the “supply side” of IT support makes it impossible to manage your client’s expectations and achieve IT success. 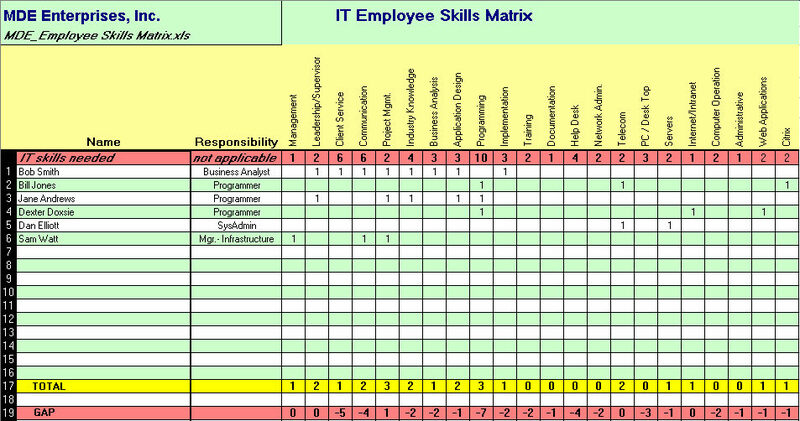 An IT employee skills inventory can be accomplished quickly and easily using a simple tool, an IT Employee Skills Matrix. This simple tool helps you quantify the skills you have and quickly identify the skill gaps that exist so you can prioritize training and education for your team. The tool is completely customizable to add any skill type you want to list as a need in your organization, , , from soft skills like communication or presentation skills to very specific technical skills like Cisco router configuration or Crystal Reports skills. 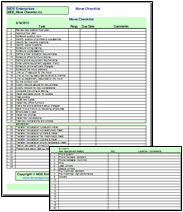 List your employees by name and responsibility in the first two columns. I like to group them by function (Programmers, Help Desk, PC Techs, etc. so I can focus on each group). List the skills you need on your team in the columns at the top. You can be as specific or as general as you want. You should also list both technical and non-technical skills. If you have conducted an IT assessment, you should have gained a perspective as to how many resources you need for specific skills, , , if not, now is a good time to look at it. Insert a row at the top of the template and call it “IT skills needed”. For each skill, put the number of people you think need to have this skill. Now, do your inventory. Work through each employee and put the number “1” in each cell reflecting he or she has the skill. The Total Row at the bottom will keep a running total of the total number of people you have in place with each skill. The GAP Row highlights where you lack sufficient number of people with each skill. You can conduct an IT employee skills inventory quickly with this tool that will assist you in managing your support business. Even better, it provides insight on where you have skills gaps so you can focus training or new hiring to address mission critical skill gaps. 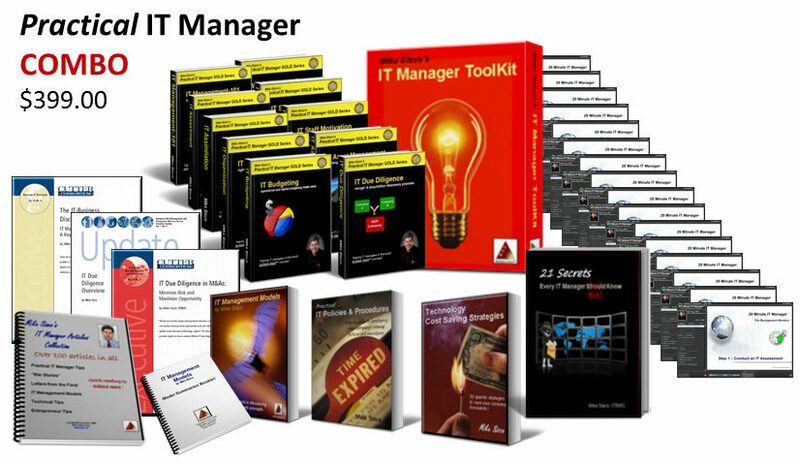 To succeed as an IT manager you must be able to manage client expectations. To do this, you have to know what your IT support capability and capacity is to deliver IT support, , , this tool can help you do just that. CLICK HERE to download the customizable template.